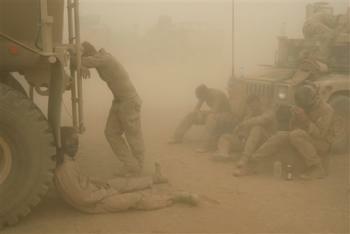 This is the sixth in a series following the U.S. Marines through the Helmand Province, Afghanistan. The Marines are continuing their success in the Garmser area of the Helmand Province in Afghanistan. KABUL–American jarheads are either prudently pacifying a swath of Helmand province or kicking out the doors and ratcheting up the insurgency. From the distance of the capital, it’s impossible to confirm anything firsthand. But the commander of the 24th U.S. Marine Expeditionary Unit came all the way to Kabul yesterday, both to proclaim initial combat success and to quash reports of extensive hardship visited upon a fleeing populace. While Hayes wouldn’t give out Taliban body counts from the past fortnight, the provincial governor puts the figure at 150, most of them allegedly foreign fighters. Hayes merely agrees not to quibble with that. British troops, who have charge of Helmand under the International Security Assistance Force – Canadians next door in Kandahar – had not been able to secure that area. The U.S. Marines, 2,400 strong and many of them battle-hardened from combat in Iraq, were recently parachuted in at the urging of NATO, desperate for fighting-capable reinforcement. … the Taliban are shoving back hard, which is a rarity since the insurgents avoid conventional confrontations, unable to counter heavy weapons and supporting air strikes. No Afghan troops have been involved in this mission. Intelligence gathered, some of it from Afghan military authorities, indicates the Taliban are pulling in their own reinforcements from other districts, perhaps other volatile southern provinces, maybe inadvertently easing the threat in places such as Kandahar, though this remains to be seen. There is no indication how long this Marine-led operation will last or how far south the Taliban will be chased. As a brief comment on the method of transport of the Marines to the theater and then to Helmand, they did not parachute in. The unit is not airborne (except for MARSOC). As we previously noted, the caterwauling about the aggressiveness of the Marine operations is expected and will subside when the success of the mission becomes apparent. Regarding the history of success, it is too easy to forget who pacified the Anbar Province. It is a very positve sign that the Taliban are deploying forces to Garmser to assist in their defenses, and it casts light on the propaganda recently spewed by the Taliban concerning this operation, proving it to be lies. The Taliban … claim the loss of one base is not critical, and anyway, for NATO to hold on to its gain it will have to commit thousands of troops to the outpost, which is located in the inhospitable desert, if it is to effectively guard the lawless and porous border through which the Taliban funnel men, arms and supplies. It doesn’t help the Taliban if the Marines are generally confined to this area of operations if they too are so confined because they have decided that Garmser really does play an important role in their plan. In other words, the Taliban are as tied down as the Marines, and in this case they are losing. The report of Taliban moving fighters into this area is confirmed by other accounts. Maj. Tom Clinton Jr. said the Marines would be in Garmser for several more weeks. It means the Marines might not take part in an operation that was planned in another southern province this month. U.S. Gen. Dan McNeill, the top NATO commander in Afghanistan, has said he needs three more brigades — two for combat and one to train Afghan soldiers, roughly 7,500 to 10,000 additional soldiers. When the Marines eventually leave Garmser, any gains the 24th has made could be quickly erased unless other forces from NATO or the Afghan government move in. Afghanistan’s army and police forces are steadily growing, but are still not big — or skilled — enough to protect much of the country. Spokesmen for both forces said they were not aware of plans to send forces to Garmser. Col. Nick Borton, commander of British forces in the southern part of Helmand, recently visited U.S. positions in Garmser, where he told the Americans he’d be happy if they stayed on. The next day, at a meeting of Marines and Afghan elders, the bearded, turban-wearing men told Marine Capt. Charles O’Neill that the two sides could “join together” to fight the Taliban. “When you protect us, we will be able to protect you,” the leader of the elders said. This last paragraph is stunning. Note well how closely what the Afghan elders said matches professional counterinsurgency doctrine. “When you protect us, we will be able to protect you.” This statement comes from the elders very soon after operations by the Marines, and it is indicative of pregnant possibilities. Yet the Marines must leave, presumably to conduct other kinetic operations elsewhere in Afghanistan. The force size is not large enough, and it seems doubtful that the British will be able to hold the terrain once the Marines leave. This most recent account of the Marines in Helmand breathes life into a languishing campaign with rapid and remarkable success, but it also shows the need for force projection and properly resourcing the campaign. Taking the terrain will help little if we cannot hold it, and leaving will possibly hurt counterinsurgency efforts when the Taliban re-enter the town and kill those who have cooperated with the Marines. Taking the terrain next time may not be so easy. Why are the British not prepared to follow this up? They have forces not far outside of Geshmar. They need to move their FOB up. I thought that only sending in one MEUSOC was light for anything but kinetic operations. I know the strains for maintaining Iraq however if the Brits are wanting to avoid casualties they should use the Marines as the battering ram and back fill them. We all know as soon as the Marines move in the talib will be right back in. You are currently reading "Successful Marine Operations in the Helmand Province", entry #1097 on The Captain's Journal. This article is filed under the category(s) Afghanistan,Featured,Marine Corps,Marines in Helmand,Taliban and was published May 15th, 2008 by Herschel Smith.